Thank you all for posting it will make job easy, and fun. 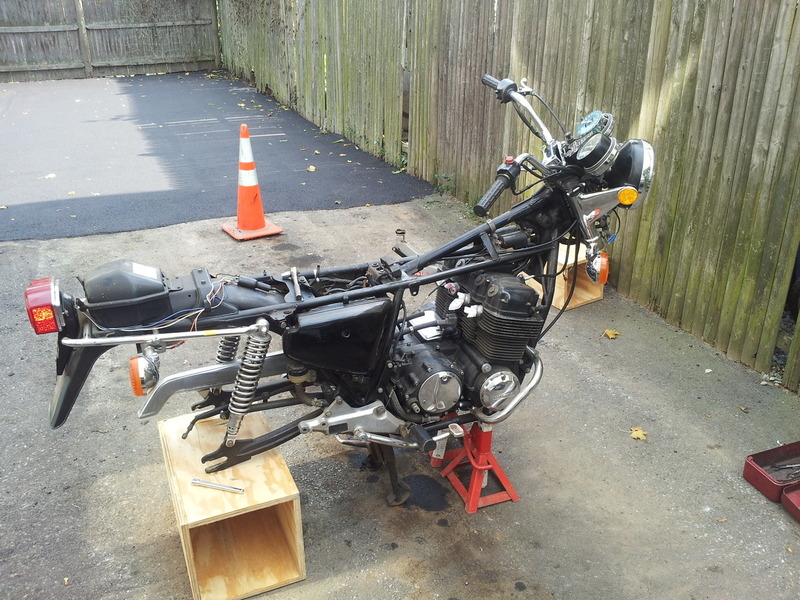 Information so far, we have a Honda Cb750F 78'. I have been dreaming about getting a 750 for about a year. 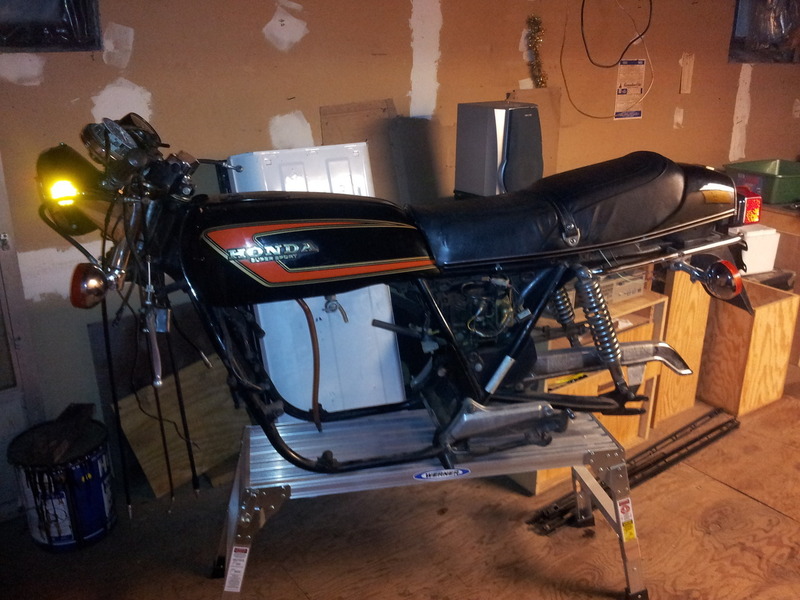 This past summer I traded my Honda cm200t(I still miss her) for the current project. Carb.s cleaned, but I still need all new gaskets. The engine turned over, and is running. It can only idle with the throttle at a quarter turn. (and when I mean Idle, I mean 2k revs) I fear the pilot jets might be clogged, the idle adjustment screw is all the way in. What should I do with the carb.s, will new gaskets fix everything? The last picture is the diagram of breather hoses. The second to last picture is the part the is bolted to the bottom of my battery box. Can someone give me the end all be all, to where all breather hoses go. From exact part to exact location. If the hose goes to open air, I will run those hoses correctly away from hot moving parts. Thanks, wish me luck. The Part in question, what is it and where do all of the hose connections go? 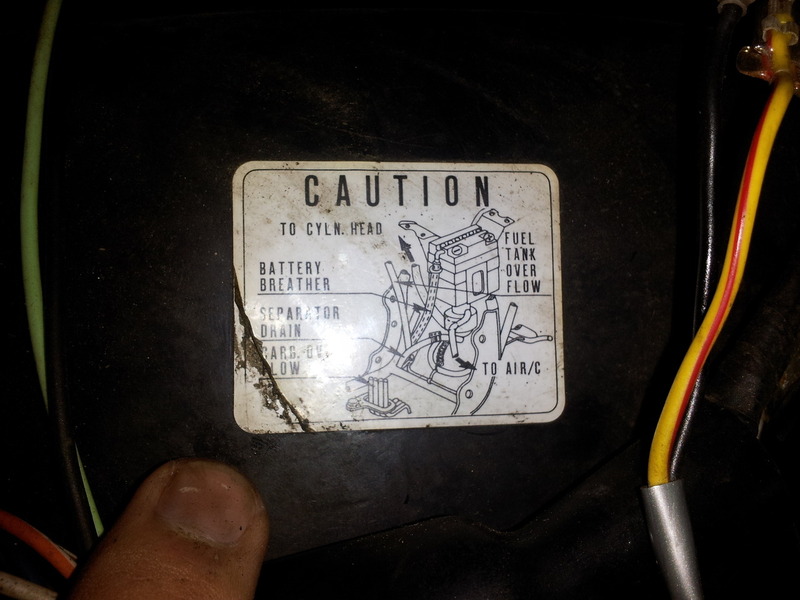 This diagram is under the seat right behind the battery compartment. Always liked that year F. Most will tell you to completly rebuild the carburetors but the first thing to do is download the service manual. From there it is straight forward. 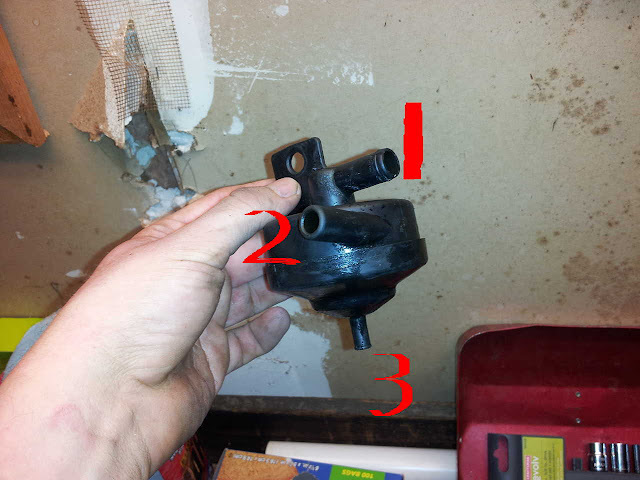 Connection one goes to the connection at the top of the air cleaner, connection two goes to the connection at the back of the valve cover, and connection three (drain) is typically routed around the front of the swingarm then back to the muffler bracket, either open to atmosphere or plugged and drained at oil change intervals. It looks like you've got an early model (75/76 750F) seperator there, the later (77/78) air seperator looks a little different, but the basic function and connections are the same (or similar). In the faq section there are the manuals. chase down the good links and familiarize yourself with them, it will help a lot to be able to just spot recognize stuff. Look at page 291 or close to that in the Honda service manual that you can download from this site. It shows where all the hoses go. I have the clymer cb750 manual, I've look through it, some times it doesn't give you enough detail. Or i might of missed it, or not even printed. I do have one tube that does have a hard end plug in the end, now it makes sense. Fuel tank over flow ---> Open Air? Carb breather port --->open air? Rear of crank case --->oil tank over flow? 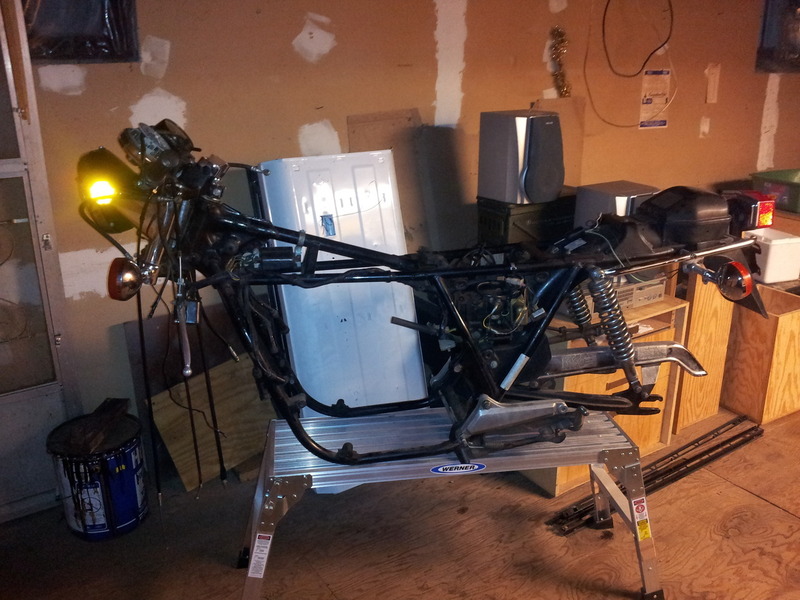 The bike is a 78', on the plaque on the neck, this could be just the frame, but parts always get traded around. Lastly, I want to find a new wireing harness, i saw a post that that cb750k (76-78?) is the same harness. I just wanted to confirm, if i'm going to have to pay for the $150 for cb750F 78' harness. 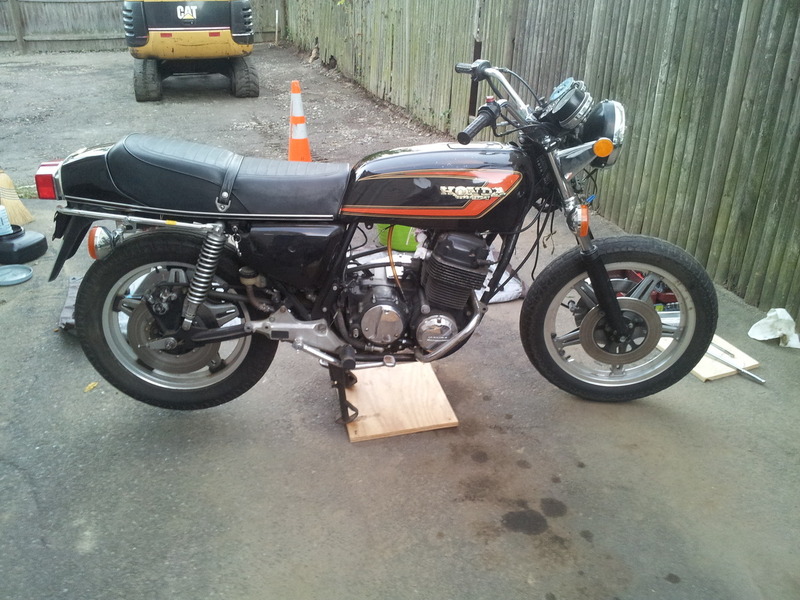 Or $90ish for the cb750k. PS. The clymer cb750 manual just says to remove fork tube seal. HOW?! I Don't Have Hulk Strength. I had to go out and buy an 18" flat blade to get the dang thing out. But it worked, thank you SOHC 4. If you cannot read and follow that diagram, which is excellent ,then I do not know how you will fix your carbs. What really scares me is when you said," Wish me luck"
You need to get a workshop manual. I have the clymer cb750 manual, I've look through it, some times it doesn't give you enough detail. This is one reason to download the factory service manual. PS. The clymer cb750 manual just says to remove fork tube seal. HOW? Progress, Its been about two months of tear down. Cover removed, its looking clean. Man its a lot of parts to take the heads off. Ok getting these cylinders/jugs off was a #$%*. I found water and a ton of corrosion in one studs, it wasn't a oil passage, but I had to pour a little soda into the passage eat away at the corrosion to get the jugs off. Cylinders are measuring great, still got some wear in them. #2 is looking a little wet...::clearing throat::...spark plug is new. Newer then I would of expected. More electrical issues, never a problem. Lower half, I've gone this far because the kick starter wasn't engaging. What is the center double sprocket between the clutch, and transmission? Does it help dampen shock to the crank shaft? The kick starter has been repaired, I need some more polishing, but its already better then before. I had a burr that was holding back the engaging tooth. A few more stripped phillips heads nothing an extractor didn't fix. I love this bike. Wish I had a 750F. Just so you know. The oil/seperator thing isn't a necessary part. All it's for is emissions. I was talking to an old timer who built these from the 70s to the late 90s he said they're completely unimportant and pointless, unless you're a "green" kind of guy. Ok, you painted the engine and then tore it completely down. Did i miss something here or are you just doing a complete teardown and inspection for "fun" ? Love that model F btw. 36 years of this stuff, here to help. Ok getting these cylinders/jugs off was a #$%*. I found water and a ton of corrosion in one studs, it wasn't a oil passage, but I had to pour a little soda into the passage eat away at the corrosion to get the jugs off. Okay, a little tip here... you see those acorn nuts? Those acorn nuts also have copper washers associated with them (the other head nut washers are steel), THIS IS IMPORTANT! I am currently correcting a P.O. 's comedy(?) of errors on a 78 750F motor right now. Those acorn nuts and copper washers seal the threads to prevent oil leeching out where these studs are exposed to the atmosphere. THIS MUST ALSO BE ADDRESSED AT THE BASE OF THE CYLINDERS WHERE IT MEETS THE TOP OF THE CRANKCASE. THESE FOUR CYLINDER STUDS EACH REQUIRE AN O-RING THAT IS NO LONGER DISTRIBUTED BY HONDA FOR THE CB750. Good news is that they still distribute this o-ring for their lawn mowers and outboard engines. Have to pull the head and cylinders just to install these four stupid o-rings. Of course this also requires a new head gasket and cylinder base gasket. madmountain.........do you have a part number available for those 4 orings? they appear to be somewhat conical shaped on mine (78F)........i cleanes up mine as best as i could an put the tiniest amount of black rtv on them to make sure they sealed. would rather replace them if they are easy to get ahold of. Thanks Madmtnmotors, I know i needed to replace all of my seals. I didn't know about a missing/discontinued o ring, sweet. Those four stud towers all had water in them at one point in time or another. I had corrosion from the stud to the wall, it took a bunch of pulls to get the studs past the thick corrosion to get the jugs off. @ Rigid, I needed to repair the kick starter, so I decided to replace the piston rings to. I'm also looking through and sizing up the project for later. My cylinders are in speck, but the pistons are a few thousands small. 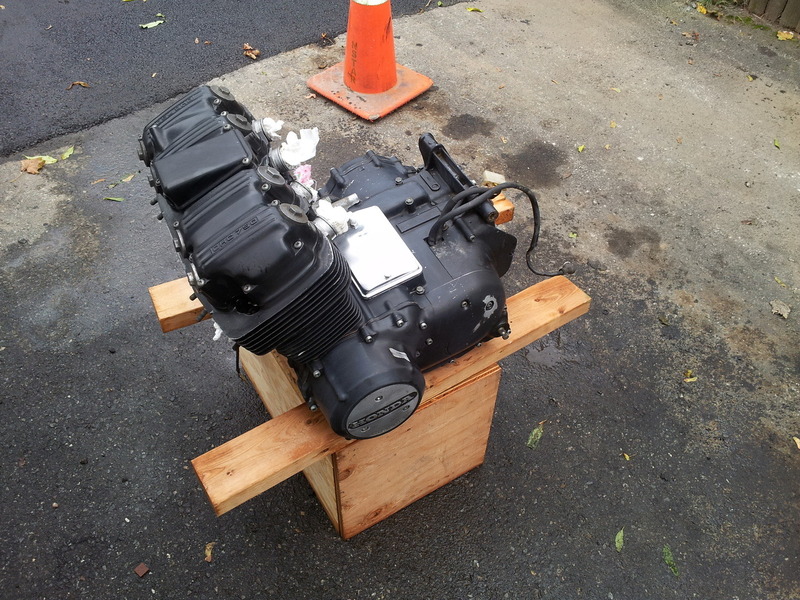 I don't have the money now, but in a year or two this engine is getting an over bore. With a few other things like new front end, rear hoop, new lighting, new front and rear wheel and tries. She's going to be road worthy enjoyable, the cb450 "Sixty Five" bobber project is next. Those four stud towers all had water in them at one point in time or another. I had corrosion from the stud to the wall, it took a bunch of pulls to get the studs past the thick corrosion to get the jugs off. Yeah, the head casting was changed on the 77/78 F model that exposes these four studs to the atmosphere where they pass through the head. I had considered greasing up these studs to help prevent the corrosion associated with this exposure. Makes their bores through the cylinders tall skinny holding tanks! Of course when run regularly and garage kept then the only water intrusion would be from riding in the rain which would burn off before having time to collect. How about electrical shrink tubing over those studs? That's what they did for the old FJ1200's Wilbur. I don't know if clearance is a problem. My favorite F. I think the Comstars really work with the F and I also like the triple disk, which was a '78 only thing. The downside is that the 77-78 F carbs are different from prior years F bikes and all 750k's. 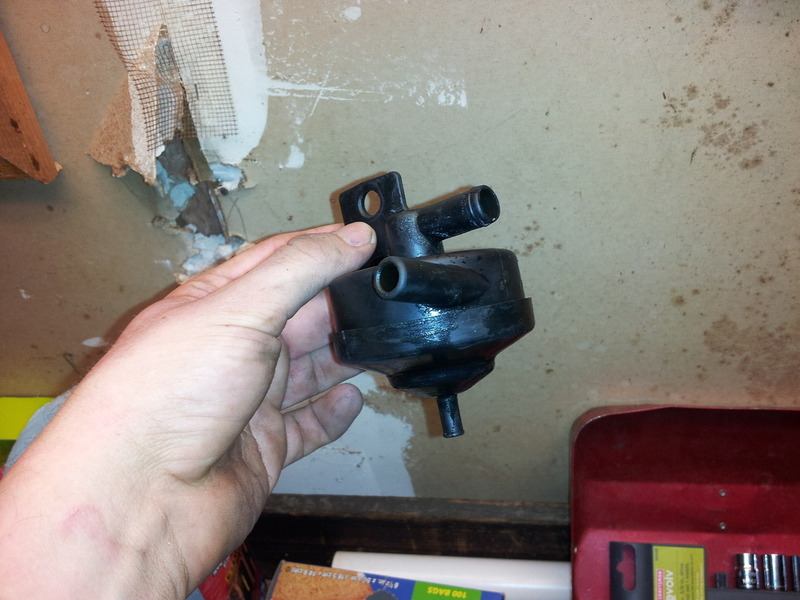 And the lower sales volume of the F model means that 77-78 carb gaskets can be a real #$%* to find. If you find carb gasket sets, even if the seller only has a set for one carb I highly recommend buying them. Plastigauge says we be good on my crank shaft, all the way across the shaft, of course. Who knows about shocks? I don't want the stock, or retro progressive shocks. I like the look of them, but I'm going modern Cafe Racer here. I'll spend the money, more money better ride. I need a part number. I know I've seen something like these on other Cb750's. I want the backpacks, but they don't have to be adjustable. Looking back through your thread just a little. Great project. Take your time and pay attention to details. And yes, a Clymer is not perfect NOR is the Honda shop manual. I use 4 manuals and each has some 'issues' whether it's model specific, translation issues or just incorrect. That separator is NOT one from an early F. The early F has the bottom drain (3) coming off at a 90 degree angle. The EXACT drain hose is no longer available for the early one but I found a 650 worked and it just needed a little length cut off. Perhaps you can find a 'replacement' for yours. That looks like the one in the online parts fiche for your bike. The drain tube is actually 3 pieces with an elbow that attaches to the outlet. No longer available. After a little thought and beer. This bike needs to run, and work well when spring arrives. I have been drooling over from pictures online, in magazines, and beautiful show/expensive bikes. This is the first bike in the long list that's posted my my wall of project bikes I want to work on. Money has been extremely tight. I haven't even had enough money to buy gaskets to reassemble my engine. After thinking about simple parts, cam chain guide, cam chain roller, cam chain, primary chains and primary chain tensioner. I am going to inspect all three chains, replace just the guides and tensioners, and button it all back up(with new gaskets of course). I don't have all of the money in the world to make this the show bike that I want, but I want to ride again. The thought of my one and only bike sitting in parts in my basement just depresses me more, and more. The first few months, turning wrenches, taking parts off. I will remember and cherish those thoughts for the rest of my life. It will sadden me even farther if I don't keep moving forward with this awesome machine 30 feet from me. To inspection, buy the parts that need to be replaced, to grease, blood, sweat, and beer. To get this bike back on the road. Well put! Good luck with the build. Riding is the ultimate goal, bling is just a bonus. You can ride the heck out of it without bling, I sure do! What companies have people been using for online parts stores? Cycle X, Cb750 supply, Vintage CB, Z1 Enterprises? I need parts but I want companies I can trust. I want a good price, I can find it for a few bucks cheaper, but who do you trust?